A large toad found mainly in the western third of Minnesota, the Canadian toad has dark, warty spots scattered around its back. It can dig burrows and is active mainly at night. It likes water more than other Minnesota toads do. General description: Very similar in appearance to the American toad, although the cranial ridge of adult Canadian toads fuses to form a large dome, called a boss, between the eyes. 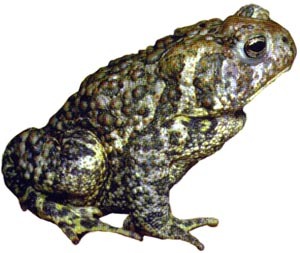 Color: The Canadian toad is brown to green with darker brown, reddish, or black spots. Its underside is light with dark flecks, especially on the throat. Sounds: A clear trill very similar to the American Toad, but lower in pitch and shorter, lasting approximately five seconds. The male's vocal sac is round when inflated. The Canadian toad breeds in late-spring (May and June). The female lays up to 20,000 eggs in the shallows along the edges of a pond, lake, or other wet area. The eggs hatch in a week. Tadpoles transform into toads in 6 weeks. Canadian toads eat insects and worms. While toads are an important part of the diet of hognose snakes, raccoons and skunks will occasionally feed on them, avoiding the toad's distasteful glands. The Canadian toad prefers wetter habitat than other toads. This prairie species often lives near standing water and woodland edges. In Minnesota, it lives mainly in the western part of the state north of the Minnesota River. Breeding habitat: Breeds in shallow wetlands, streams, and roadside ditches. Summer habitat: More aquatic than most toads, typically found in or near the margins of prairie wetlands. Capable of tolerating extreme heat by remaining dormant for several days. Winter habitat: Subterranean, burrows below frost line. This species often overwinters communally within small earth mounds, called mima mounds. These mounds may hold several hundred toads over the winter. The Canadian toad has no special status in Minnesota. Many Canadian toads spend their winters in mounds of soil called mima mounds. Each mima mound may have hundreds of toads.